For about a year now, Aerial Silks Yoga has taken me to new psychological, physical and spiritual places. The silks offer the opportunity to surrender into a physical lightness akin to weightlessness. From there, the spine, the legs, the head, arms and joints can move in playful and unusual ways. I have experimented with backbends and headstands. 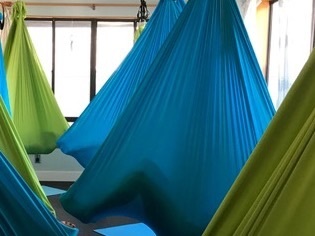 By hitching the silks right under the hinge of the hips, then leaning forward into downward dog, I can then lift my legs off the floor, criss-cross them over my torso and look at the world upside down for a while. The shift in gravitational orientation and visual point of view are incredibly refreshing to my body and mind. Shavasana takes on a whole new dimension lying inside the silks. They swaddle and hold you. They move gently with each inhalation and exhalation. They rock you tenderly. Occasionally at night before I drift off to sleep, I feel that rocking. Shavasana in the silks reminds me that I am held in love! I provided a soundscape for one class last year. Floating in a Silky Belly is a piece I created especially for Shavasana in the silks. The scale is C Phrygian with lots of accidental tone harmonics (black keys). Kay Gardner, a pioneer of harmonics and healing, in her course Music as Medicine, offers a template for aligning harmonic tones with colors, chakras, emotions, etc. The tones in this piece form a container for feelings, appetites, insights and intuitions. They hold and move the energies of the belly and brow chakras. Here is one version of Floating in a Silky Belly. So I am launching a new project that is pulling together interesting ideas and questions from other projects (Folding/Unfolding, Separation and In-Between, iBoD). This has been percolating for some time and just came clear in the last few weeks. 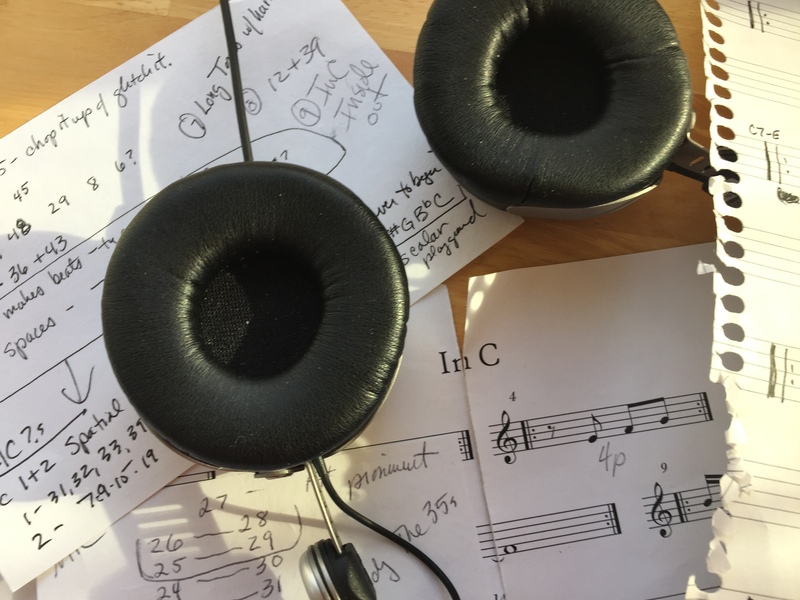 In a recent Audio Origami post (http://wp.me/p5yJTY-eI) I wrote alot about Terry Riley’s In C, renamed it TRIC and began studying the patterns of TRIC as if they were notated samples to be used in producing soundscapes. Then I discovered I had written about this idea at the end of My Year In C. (See http://wp.me/p4dp9b-dl) That was two years ago, and now I have greater clairaudience as to how it will unfold. Studying the patterns as individual packets of sound frees them from the linear progression of the TRIC musical score. Now the patterns can talk among themselves, shift their shapes and reveal other songs contained within. Varieties of harmonic configurations emerge that may never have been heard before. By this I mean – when musical groups play through the TRIC score, only certain patterns are heard in overlap when the musicians follow Terry Riley’s suggestion to stay within 2 or 3 patterns of each other during performance. What happens if patterns from disparate parts of In C overlap each other? What harmonics come forth from these mergers? What kinds of musical sequences emerge? These are examples of TRIC Questions that will be explored in the coming months. I am deconstructing/reconstructing/tweaking TRIC by allowing the patterns free-rein to not only interact, but shift their structure to accommodate the interactions. For me, TRIC is sonic DNA, some kind of cellular message, literally a vibratory tonic, offering a smorgasbord of rhythms and intonations to mix it up with. Using the TRIC patterns as samples creates alternate Universe versions of TRIC . Each of these pieces will be its own creation, while retaining the mark of the original.